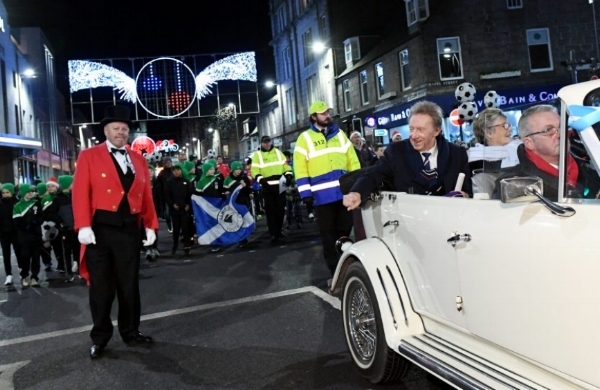 The former Manchester United striker and charity ambassador led the annual Christmas lights switch-on parade, following Saturday’s conferral ceremony at the Beach Ballroom. The 77-year-old, who was born in the city, said: “I really didn’t expect the reception I got, I’m almost lost for words, it was just unbelievable. “The parade down Union Street was wonderful and to come out on the Town House balcony and get such a warm reception is something that will stay with me forever. “I have always called Aberdeen home and this weekend has meant so much to me. In the 1964/65 season, Mr Law won the Fifa Ballon d’Or award. He also jointly holds the Scottish international record goal tally, alongside Kenny Dalglish, with 30 goals from 55 caps. Mr Law was joined by family and friends as well as young representatives of community groups and clubs associated with his Streetsport initiative, an award winning programme led by the Denis Law Legacy Trust, when leading the parade on Sunday. Streetsport recently won an accolade at the 2017 National Pride of Sport Awards, taking the TSB Community Partner Award, which recognises a group of people who have worked together for a good cause in their area. Lord Provost of Aberdeen Barney Crockett said: “Denis is a unique Scottish icon, there is nothing but good feeling towards him and that is because of his great personality, modesty, integrity and of course his achievements in football and in life.